You're a smart guy, I think you can figure it out. rbi, get back on the track. oh whoops, not the rx1s. get the exas. 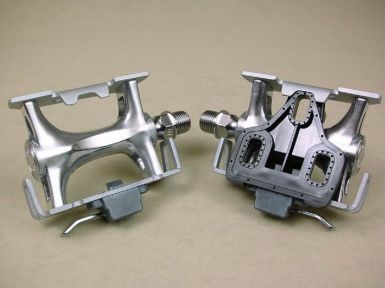 The Exa pedal is derived from the Royal Nuevo pedal body, and includes a special locking cleat to reduce the chance of accidental disengagement. 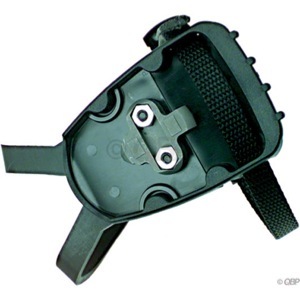 It is best used for events against the clock (kilo, team sprint, pursuit) where the security of a positively locked cleat (mounts to common 3-hole pattern shoes) used in concert with a toe clip and strap may reduce the chance of pulling a foot at the start. Toe clips and straps are not included in the purchase price. awesome idea, why didn't i think of that?? ahhh you see what i did there? yeah they do look kinda bulky/heavy. and the cage doesn't look to be large enough or adjustable. tfunk just doesnt get it. "ahhh you see what i did there?" Fail for self-referential post without allowing someone else to notice what you did there first. At first I was like what in the hell?!?? RX1's are ONLY FOR THE TRACK. You must reach down and release a lever. Please Ridazz do not ride these on the road. There are some manufactures that make actual clipless pedals with clips. I have seen them in asia. I believe they are Exustar or Wellgo's, I can't remember. Too much Tiawan beer. @rbi: don't get what? i want to cop these so i can ride my fixie (right now they got spds) with regular sneakers, except i like to rock bball sneaks which are a bit wider/thicker than your typical chucks so i would like wider cages. fashion over function? see, you dont get it. rbi! you guessed the theme for this month's pedal punx ride! skinny jeanz, glasses with no lenses, grills, the whole 9 yards. fyi tfunk, you will ruin your technicolor nike x retard collab dunks if you ride your brakeless "fixie" with them. keep your spds. if youre feeling ugly and not hip amongst your teenage circles, channel pollock with some house paint and have your own one off design. then youll be super hip because you will be the only one rocking that eyesore. i hope this helps. rbi wanna see me riding a fixie? come to sfvcm tomorrow night you'll trip out. i blew out the sidewall in my front tire on sunday and had to walk from riverside/los feliz back home. i was so pissed. if my wheel is fixed by then i might show up. these clipless cage adaptors are ~$30 on ebay. think im gonna give them a try! maybe i can ride my fixie barefoot to the beach and not worry about getting sand in my shoes. today is my first day on a fixie and i have already discovered trackstand variations, skid hopping, and wheeling from a trackstand. am i cool yet? When did you get a fixed gear Junu? what about that bike you built up and sold after your gt was stolen? I remember seeing that bike at Crank Mob after you sold it. didn't he sell it to that religious dude? haha, i remember that. you should have charged him $100 more by saying it was blessed by the pope. clipless clips are pretty redundant, but i guess that's the purpose. it's like doubling up on condoms, haha.